One of the best Trainer for entry level player. Evrything have come in one package, you dont need to buy anything for make Busy Bee to be ready to fly. It just Come out from the box, turn it on and ready to fly in minutes. 372 sq. in. wing area. Molded bead foam construction on wing and fuselage. smooth molded foam stabilizer and rudder. All electronics are pre-installed and ready for use. the powerful OUTRUNNER brushless motor is installed and connected to the electronic speed control. The nose wheel is steerable and the servos and pushrods for the elevator and rudder are pre-installed and ready for hook up. The tail surfaces are attached to the fuselage with screws and the main wing is held on with rubber bands. Charge the 2-cell LiPo battery with the included Cell Balancing Lithium charger, from a 12 volt DC battery or power supply. 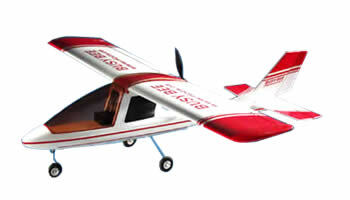 The aircraft is a stable flyer with a gentle stall and very good take off and landing manners. While not a first airplane, Busy Bee makes a great first aileron airplane. Flight times exceed 10 minutes of strong climbs and general aerobatics.